You might as well imagine a large red flag fluttering from the summit of Mount Everest. That’s what the outcome of the parliamentary and provincial elections in Nepal suggests. The Communists have won both decisively. In the parliament, the Communist alliance will hold close to a two-thirds majority. The government that this majority forms will not only be able to last the full five year term – the first time this would have happened since Nepal adopted parliamentary democracy in 1990 – but it will be able to revise the 2015 Constitution. Both the parliamentary and provincial results show that the Communists won across the country from the countryside to the cities. Even though they have a strong mandate to govern according to their agenda, the likely Prime Minister K. P. Oli said carefully, “We have seen in the past that victory often tends to make parties arrogant. There is apprehension that the state will become oppressive. Winners tend to become indifferent to their responsibility.” This is not something the Communist government will do, said Oli. What allowed the Communists to win so conclusively? The incumbent, the Nepali Congress, was wracked by corruption scandals, infighting, and the lack of any vision for the country. In 2015-16, when the Indian government closed its border to landlocked Nepal, the Congress could not find the words to condemn India. The Communists, particularly Oli, did not hold back. Nationalist sensibility drained from the Congress toward the Communists. But further, the Congress came to the people for this election with an incoherent alliance, cobbling together a coalition that included the Madhesi parties and the monarchist parties – parties of minority populations and the king. There was no way that this haphazard alliance could appeal to the people. 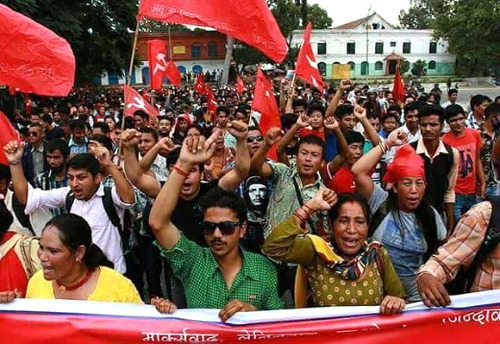 The Communists, on the other hand, went to the people with a very simple slogan: “Prosperity Through Stability.” Since Nepal emerged from the monarchy in 1990, it has been racked by troubles. Failure to create a democratic process sent one section of the Communists to open up a decade-long armed insurgency that ran from 1996 to 2006. About 17,000 people died in this war, which ended with a new democratic process through a Constituent Assembly. The monarchy was abolished in 2008 and the Constituent Assembly drafted the Constitution of 2015. Nonetheless, there have been 10 prime ministers in the decade since the armed insurgency ended and there has been precious little in the way of social development for the people. It was time for something other than corruption and despondency. 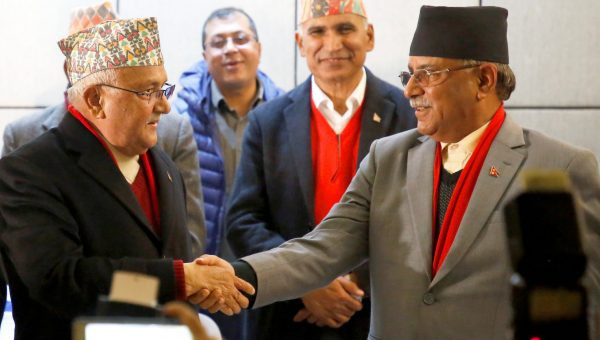 Two of the main flanks of Nepali Communism – the Maoists and the Communist Party of Nepal (Unified Marxist-Leninist – UML) – decided to go to the polls together and to pledge that they would form a newly united party after the elections. This second call – for the creation of a newly unified party – promised even more stability than the electoral alliance. It showed that the Communists – who had previously been at each other’s throats – could come together on a joint program. If they could hold that unity, then perhaps they would be able to deliver stable government for five years. This perhaps was most appealing about their campaign. It paid off at the ballot box. While Communism came to China and India in the 1920s, it missed Nepal, which is sandwiched between the two countries. Harsh repression by the monarchy prevented any progressive movements from taking root in the country. It was not till the 1940s that Communism made any impact inside Nepal. A brave strike by the workers of the Biratnagar jute and cloth mills in 1947 drew in communist activists, such as Man Mohan Adhikari. Adhikari was exiled to India. He, along with Nepali students in India, worried that the Nepali elite – the Ranas – were ready to join with the imperialist powers to set up a military base in Nepal. This would draw Nepal into the orbit of the West and surrender its independence. These students and activists were influenced by the Communist Party of India. One of them, Pushpa Lal Shrestha, translated the Communist Manifesto into Nepali in 1949. 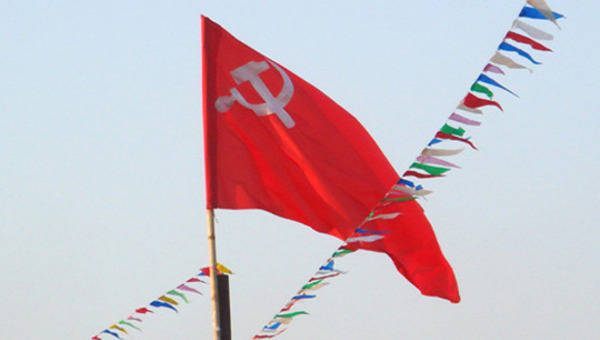 Later that year in Calcutta (India), Pushpa Lal Shrestha, Adhikari and others founded the Communist Party of Nepal. In the first decade of its existence, the Communist Party called for the end of the monarchy and the establishment of a republic. It also called for the creation of a Constituent Assembly. Deep divides inside the party over the question of the monarchy and elections tore it apart. Splits were inevitable. Armed struggle came on the table at the Fourth Convention in 1965. The question of armed struggle divided the movement till 2006. After 2006, armed struggle fell off the table. It had cost the country far too much. The bulk of the Nepali left, however, had not taken up the gun. It had built popular struggles against the monarchy, feudal authority and capitalist property relations. 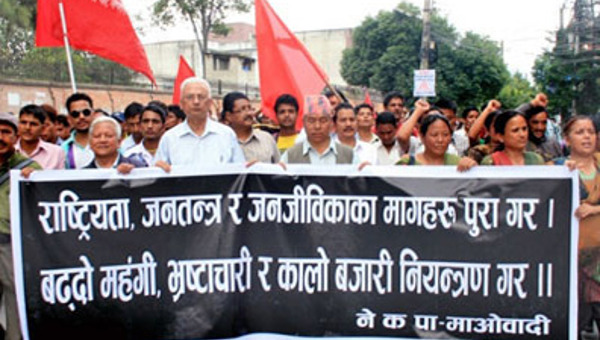 The United Left Front, which was formed in 1990 to fight for a democratic system in the Jan Andolan, was guided by what would become the Communist Party of Nepal (Unified Marxist-Leninist), one of the main pillars in the current Communist alliance. They were the backbone of the fight to restore democracy. The other pillar of the current alliance is the Maoists, who have now accepted parliamentary democracy. It is these two parties that will likely merge in the new year into one of the most formidable political forces in Nepal. The Maoist leader Pushpa Kamal Dahal (also known as Prachanda) arrived in his constituency of Chitwan to celebrate the victory. “Both the processes of government formation and party unity would move ahead simultaneously,” he said. Prachanda – from the Maoists – will take over as leader of the party, while Oli – from the UML – will be the prime minister. 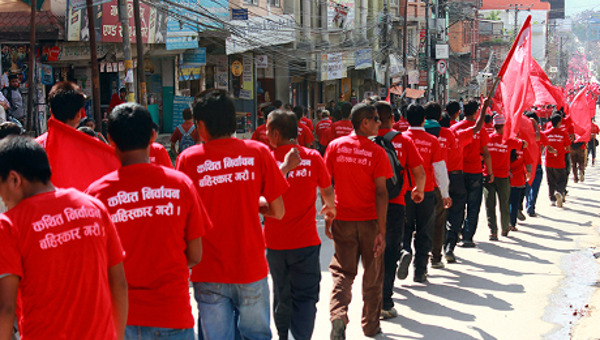 The broad currents of Nepali communism, which emerged out of the formation of the party in 1949, will now come together. What will be the agenda of the new government? K. P. Oli, who will be prime minister of the Communist government, has said that he wants to put stability of the government at the front. But stability itself is not enough. Nepal suffers from great poverty and from great weakness in its infrastructure. Oli has said that he will welcome investment to build Nepal’s basic infrastructure, including a Chinese railroad from Tibet into Nepal. This is not a tilt toward China, as some suggest. It is more likely a carefully calibrated position by the Nepali communists to stand mid-point between India and China – the regional behemoths. Pragmatism is the name of the game, not fealty to China on ideological grounds. All parties in Nepal – including the monarchists – want their country to graduate from the Least Developed Country status by 2022. What differentiates them is the path toward that goal. The Communist alliance pledges that per capita income will rise to the equivalent of $5,000 per year from a meager $862 per year at present. To raise the per capita income would require investment in education and health as well as to dramatically increase jobs for young people (currently two million out of 28 million Nepalis find work outside the country). Where will the government raise resources for all this? An end to corruption will save the treasury a great deal of money. But more than that, more efficient use of tax money will provide the means for development. Fiscal federalism is a major part of the Left’s agenda. It hopes to devolve 50 per cent of the resources to provincial and municipal governments. It is hoped that they will better use the money toward local development. The bet is that a stable government will draw in money and tourists to Nepal – and that the money can be used to develop organic agriculture and clean energy (including hydropower) that will lighten the burden of importing energy. This article first published by AlterNet . Vijay Prashad is the George and Martha Kellner Chair of South Asian History and Director of International Studies at Trinity College, Hartford, CT. His most recent book, The Darker Nations: A People's History of the Third World, won the Muzaffar Ahmad Book Prize for 2009; Red Star Over the Third World (LeftWord, 2017) and The Death of the Nation and the Future of the Arab Revolution (University of California Press, 2016); and the Chief Editor of LeftWord Books.